Lamar Advertising Company Announces Acquisition of Marco Outdoor Advertising, Inc.
Baton Rouge, LA – August 5, 2014 - Lamar Advertising Company (Nasdaq: LAMR), a leading owner and operator of outdoor advertising and logo sign displays, announced Tuesday that it has acquired the assets of Marco Outdoor Advertising, Inc., enhancing Lamar’s position in New Orleans and the surrounding market. The all-cash acquisition adds more than 150 bulletin faces, including six digital displays. Marco's inventory is concentrated in New Orleans, particularly along the Pontchartrain Expressway and other major routes into the city, with additional coverage in the bedroom communities on the Northshore of Lake Pontchartrain. "I've enjoyed building Marco over the last 27 years and being part of the New Orleans corporate community," said Marc Winston, owner of Marco. "I'm excited to be able to hand off the business to another Louisiana company. I wish Lamar the best." What’s Hot in Out of Home? 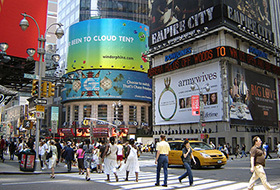 Media planners and buyers say advertisers are eager to use digital billboards and three-dimensional mapping and wallscapes, part of a boom in new media techniques that has sparked renewed interest in out-of-home. Lamar Advertising Company (Nasdaq: “LAMR”) will release its second quarter ended June 30, 2014 earnings report before the market opens Thursday, August 7, 2014.